Large-size slabs in marble-effect porcelain stoneware. A white background with thin, light gray veining. One of the most popular solutions for international architecture and design. The dominant white colour ensures the Carrara Pure slabs by Atlas Plan pair well with any colourway, but it is also perfect for an all-white space. Balancing beauty and function, this marble-effect ceramic material supports the creativity of architects and designers in any situation. The slabs come in a 162x324 cm size with a thickness of 12 mm and are available in a silk finish. Ideal for furnishing any space in domestic or commercial settings. 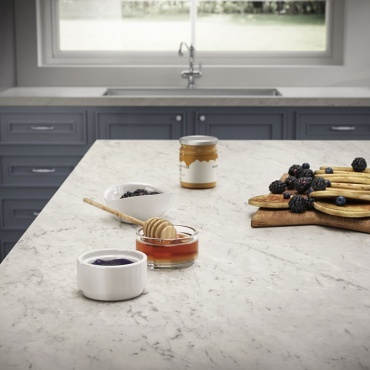 Indeed, Carrara Pure is suitable for covering kitchen islands and worktops, bathroom vanity units and household tables; but also bar and restaurant counters. Carrara Pure Habitat: Carrara Pure silk slabs by Atlas Plan are paired with Arbor Tobacco by Atlas Concorde. The American-style setting is enhanced by functional volumes and surprising colours, illuminated by lamps with industrial overtones.